A representative from a women’s organization describes how CBHI improves women’s lives. In Ethiopia, there is an old tradition called idir or kire of community organizations providing financial help to families for emergencies, like funerals. But a new form of “idir/kire” nicknamed “edir/kire while alive” is gaining traction as the Ethiopian government pursues its goal of providing universal health coverage. That scheme is community-based health insurance or CBHI. CBHI is health insurance that pools members’ premium payments into a collective fund, which is managed by the members, and covers basic health care costs at local health centers when a member is sick. The insurance is even accepted at hospitals when a member is referred by the lower level health facilities. “Now the CBHI scheme helps us to get treated when we get sick rather than waiting until we die to support our funerals,” said a farmer in Tehuldere district, Amhara. 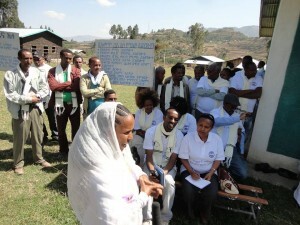 Piloted in 13 districts or woredas in Amhara, Oromia, Southern Nations Nationalities and Peoples, and Tigray, CBHI has been well received by the communities since being introduced in April 2012. More than 144,000 eligible households have enrolled and more than 650,000 beneficiaries have accessed health services. Most of the services have been accessed at local health centers, but some beneficiaries have also been seen at hospitals, following referral. CBHI primarily covers essential health service packages at the healthcenter level. The benefits includes both inpatient and outpatient services. All types of essential health services that would be covered through out-of-pocket spending at time of sickness are covered by CBHI schemes. Due to CBHI’s initial success, the Ethiopian Health Insurance Agency (EHIA) decided to scale up CBHI to an additional 161 districts, with technical support from the HFG Project while the CBHI schemes in 13 districts are under evaluation. To inform more people about CBHI and its financial protection benefits, the EHIA recently launched a national communications campaign. 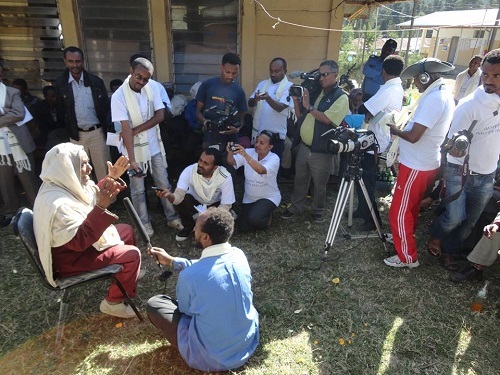 In collaboration with the EHIA, the HFG Project invited the media to visit the CBHI scheme in Tehuldere district in Amhara last month. A beneficiary explains the benefits of her CBHI scheme to journalists during the national health insurance communications campaign. Mrs. Aselefech Tesgaw has a family of five and is member of the scheme, contributing 144 Birr, or $7.50, each year. She told the reporter that she and her family members have not been sick and haven’t needed health care, but she is proud that she joined the scheme because other community members can use the health services. News stories about Tehuldere’s CBHI scheme appeared in The Ethiopian Herald and The Addis Zemen, both of which are national newspapers. It was also featured on Ethiopian National Television. In speaking to the Addis Zemen (an Amharic-language national newspaper) , Mrs. Roman Tesfay, General Director of the EHIA, said the strong ownership of CBHI schemes and their commitment of community members to paying their contributions on time have led to its success. Based on lessons learned from the current scale-up, the EHIA plans to extend CBHI to over 800 woredas in Ethiopia’s quest to achieve universal health coverage for its people.